1. Gluten-free baked goods taste awful. Those in the traditional baked goods world are used to everything tasting like wheat – because everything is made with wheat. But the typical wheat-based diet leaves out dozens of other grains/flours – each with their own flavor profile. If all you’re eating is rice-based foods on an allergen-free diet you are missing out! 2. Cow’s milk is better than alternative milks. “Got milk?” We are so brainwashed. We have been taught to believe that we should be drinking cow’s milk – milk from another mammal. Humans are the only mammals on the planet who drink another mammal’s milk. Every other mammal moves on to water once weaned. If you are concerned about getting enough calcium, both rice milk (fortified) and hemp milk (fortified) have the same amount of calcium per serving as cow’s milk. Hemp milk also has some great properties that cow’s milk doesn’t have – Omega 3 and 6 essential fatty acids. And hemp is a complete protein with all 10 essential amino acids. Take that, cow’s milk! 3. You can’t bake without eggs. Eggs are the last ingredient that most of us want to hold onto for baking. Even the big name gluten-free vendors have yet to tackle egg-free baked goods for their off-the-shelf lines. But vegans have been doing it for years and so have I. Baking without eggs isn’t impossible, it’s just different. 4. You can’t make meringues without eggs. Until recently I would say that you can make anything without eggs except an essentially egg dish (e.g. quiche, scrambled eggs) or meringue. But even the egg-free meringue myth is now busted! Um, there’s that cow sneaking into our kitchens again. My advice is to think of butter as shortening. It is easily replaceable with any other high quality shortening or coconut oil. Many shortening products are combinations of oils – check the labels and choose one that is safe for you. In nearly every commercial kitchen or restaurant this is true. If it’s flour it must be wheat, but it doesn’t have to be! Rice, sorghum, millet, amaranth, quinoa, corn and bean flours are just a few of the options available. 7. Baking without wheat, eggs, milk, and butter is impossible. Replacing one of these ingredients is hard, replacing all of them might seem to be impossible – but it’s not. It is true however, that the rules have changed. The traditional formulas/ratios won’t work. Once you understand how new ingredients behave and how to combine them it all becomes possible again! 8. Food allergy foods are all empty calories. Often, this is true. Many off-the-shelf foods made without the top-8 allergens are high in starch, sugar, and calories. Check the labels and you might notice that portion sizes are small so that the calorie counts appear equitable with traditional baked goods. The solution is to make your own baked goods from scratch using just as much sugar and as much starch as you need. 9. Gums are bad for you. Well, xanthan gum is a created food and some argue that it’s not good for you. Guar gum is derived from a seed. I will certainly not claim that gums are good for you (they provide no nutritional value), however they provide a valuable assist when baking. My solution is to use as little as possible. My rule of thumb is ¼ teaspoon xanthan gum per cup (or partial cup) of flour. If you choose guar gum, use ½ teaspoon per cup (or partial cup) of flour. 10. Food allergy foods are expensive. 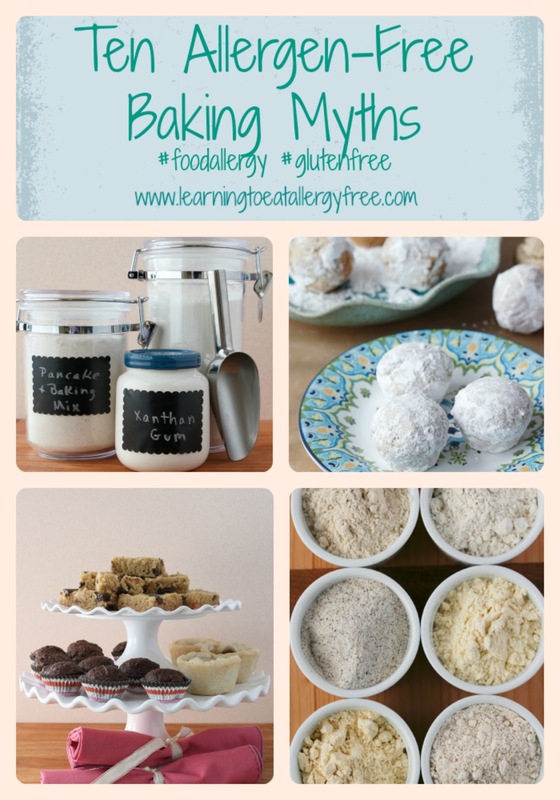 This is certainly true for processed allergen-free foods, baking mixes, and flour blends that you buy off the shelf. There is a cost that comes with making sure foods are processed safely and not contaminated. I’ll gladly pay extra to make sure food is safe. But what if you make food – from scratch – at home? The cost goes down considerably and no worries about reading labels! Now, get into that kitchen and start baking! There are some great tips here. Before I was faced with food allergies I would have thought the same things but I've been amazed at the delicious things I can make with so many restrictions. THANK YOU for this post! Though I am not gluten free/egg free, or fully dairy free, I have been following your blog for almost a year now due to an elimination trial I started to find out which foods trigger migraines. It has & will be a longer road than expected. Sometimes it is easier to cook/bake all allergen-free recipes rather than ones I'd have traditionally done. And now my fiance is embracing it as well! Emma and Colleen, thanks for your comments. So glad you found the tips helpful!